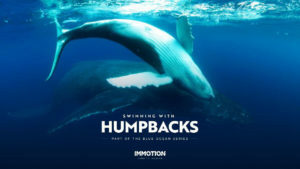 Immotion Group, the UK-based immersive virtual reality (VR) ‘Out of Home’ entertainment business, is pleased to announce the release of its new live-action VR experience, Swimming with Humpbacks. This world-first experience provides a rare glimpse and insight into one of the most mysterious creatures on the planet, the giant Humpback whale. The breath-taking short film is exclusively available on Immotion’s VR Cinematic motion pods at the Company’s ImmotionVR stores across the UK. Building on Immotion’s VR aquatic expertise, the experience is the first instalment in Immotion’s Blue Ocean Aquarium series. 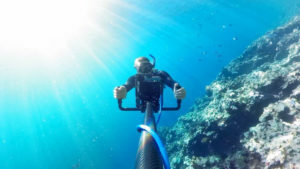 To create it, the Company joined forces with Jeff Hester, a leading free-diving cinematographer. 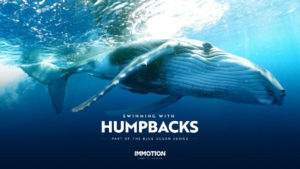 He successfully filmed a pod of humpback whales in live action VR in the Kingdom of Tonga on migration from Antarctica during the mating season. Virtually every move the whales made has been captured. Viewers can witness incredible scenes including a female giving birth and bonding with her calf, young whales playing, and a frenetic heat run. During the heat run, males vie for the attention of the female whale and chase her in an ocean sprint that can go on for hours.